Hello everyone and welcome to the first installment of Top Tune Tuesdays! It’s no secret that the beginning of the week could be a bit of a challenging time for us all especially those of us who commute. These 5 songs I’ve selected are perfect for easing the grind of your train delay, that super loud person on the bus or when you’ve been in bumper to bumper traffic for more than just a few minutes. Each of these 5 artists is among some of my favorites and hopefully, you’ll enjoy them as well! click on the link to give them a listen! Rock and roll music can mean many things to many people and how one perceives it can vary greatly depending one’s own expectations. Most current rock and roll bands are obsessed with trying to find their sound and perfect it, local Manasquan band The Flukes seemed to have found theirs on their debut EP From The Depths Pt 1 Deep which is an infectious and exhilarating collection of songs full of chemistry and exuberance. The feel and tone of the EP is very much influenced by bands such as Red Hot Chili Peppers and other funk inspired bands but still manages to retain a vibrant and organic energy of it’s own throughout. opener “Edge of Town” starts proceedings off with some strong psychedelic rock and funk vibes and boosts some truly expressive guitar and instrumentation, the band’s unity and fluidity is very much on display here as well. The Flukes display a very diverse and well-rounded sound and that comes through on track “Euphoria” which is more romantic in terms of songwriting and has a warm and mellow atmosphere with some groovy guitars and drumming and “What a Ride” the lead single off the EP is a classic-sounding old-school rock number that contains spirited and electrifying performances from the entire band. What allows From The Depths Pt 1 Deep such an enjoyable listening experience is that The Flukes as a band are dedicated to making rock and roll music that’s pure fun yet still musically distinct. Each song has loads of charm and energy and in terms of presentation each number has a flare and cohesion that plays off the preceding track effortlessly. What truly makes The Flukes such a promising and engaging act is that their album manages to be ambitious and grand in terms of sound while also remaining focused and well-crafted. This can be indicated on closing track “Found” which is a sprawling 8-minute track that stills manages to pack in tight guitars, killer solos and an all around exhilarating performance from every member of the band. The overall package of From The Depths adds up to some of the most consistently satisfying and enjoyable rock music released this year and is indication of The Fluke’s ever-growing potential. Rock and roll will always continue to change and evolve, but with the presence of up and coming bands such as The Flukes, it’s spirit will no doubt live on and hopefully find some listeners along the way, what a Ride it’s gonna be. Rock and roll has a notable history of love songs and songs about immense and dramatic displays of emotion. One topic rock and roll however doesn’t always get to explore is that of broken relationships or relationships that can be toxic and deadly to our physical and mental selves. Local New Jersey Callout a female-fronted alternative four piece group examine this subject with an unflinching intensity in the video for their latest single “Mad Love”. The group consisting of Becky Khusidman on lead vocals, Jake Feldman on lead guitar, Brian Cater on drums and Anthony Sabino on bass fuel their song with a gothic darkness and a visceral instrumental-based sound not unlike that of Halestorm or Evanescence but still containing their own distinct style and delivering emotionally charged performances in the process. The video itself is a unique interpretation of the song, taking on a very theatrical approach that’s cinematic yet grounded. The video manages to utilize visual storytelling effectively as it depicts an abusive relationship and one must endure before they decide to make a change and free themselves of the situation. Visually it’s a mix of trippy yet atmospheric visuals and the band all deliver exhilarating performances showcasing their sense of unity and distinct styles. The performances of the two leads Jade Barry and Kenneth Raspas are natural and emotive allowing for us to gain resonance for the narrative. Overall Callout’s latest single and video announce them as a dynamic act willing to create insightful yet invigorating rock and roll, check out the video below to see it for yourself! They say that being in a band can feel like family but for Manasquan-based rock band The Flukes, that saying holds even more true. The Flukes started out as jam sessions between lead singer Kyle Missry and lead guitarist Anthony Trilli who eventually recruited his two brothers Joe Trilli and Mike Trilli as drummer and bassist respectively. What started out as the band practicing Nirvana and Red Hot Chili Peppers covers eventually led to them performing on-stage at famed venues such as The Stone Pony and Starland Ballroom, with a new single out and their latest EP to be released soon I sat down with The Flukes to discuss their humble beginnings, the importance of a good dynamic and where the band’s future is headed. In the early days lead singer Kyle Missry and guitarist Anthony Trilli began by simply practicing Front Bottoms songs and Missry attempting to teach Trilli guitar, when Missry took an absence for school he returned to find the roots of a band forming. “In that gap I decided I wanted to learn this thing so I started practicing old Nirvana songs through youtube and eventually I went to Joe and Mike” says guitarist Anthony Trilli, from there the band started to formulate it’s early sound and establish the dynamic they carry today. In their early days, The Flukes were very much inspired by classic rock groups such as Led Zeppelin and Red Hot Chili Peppers and attempted to harness their influences into a sound that was distinctly their own. “We tried mixing a bunch of sounds to create our own and took parts of each genre into our sound” drummer Joe Trilli says about trying to define The Fluke’s signature style. For their forthcoming EP From The Depth Pt.1, The Flukes as band want to create a sound that’s more prominently their own and representative of where each band member is coming from, “For this EP we really wanted this sound to be who we are and what we’re feeling” expresses drummer Joe Trilli. Adding to that lead singer Kyle Missry discusses how the EP will hopefully be a launching point for the band going forward, “We’re still in the early stages of writing our own music so we’re not entirely sure what our identity is yet but we’re working towards it.” The band is aiming to create a dynamic musical experience on their EP with each song offering something distinct for listeners. Speaking about the songs on the EP, the band emphasize that each selection showcases a unique aspect of the band itself. “We’re not just chasing one sound, whatever’s coming out is being put out, there’s no we can’t use this cause it doesn’t sound like us because nothing sounds like us” expresses lead guitarist Anthony Trilli. The process of recording their EP has been very collaborative with each band member being involved in the creation of the music. In addition to crafting their latest release, The Flukes are dedicated to giving audiences a memorable experience on stage. The experience of watching The Flukes live is undeniably vibrant as the band dons extravagant wardrobe and run and jump on stage while engaging full-on with their instruments displaying a notable enthusiasm while doing so. The chemistry and cohesion of The Flukes as a band stems from the fact that three of it’s four members are family and their mother Grace serves as their manager, they also learned their instruments together at the same time. It wasn’t until their first Brighton Bar show however that the band pushed through to what they were truly capable of together, “The bar was just set high and we had to pass that bar every time” Anthony Trilli says. From there, the band has performed alongside notable local bands such as Work In Progress at The Stone Pony and Starland Ballroom and this past summer performed alongside The Ones You Forgot at their EP Release show at The House of Independents. Currently, The Flukes are planning their own EP release show and have just released their debut single “What a Ride”, but more importantly they’re dedicated to being the best possible band that can be. “If you don’t have the desire to move forward it’s not gonna work, you all have to have the same mindset”. Drummer Joe Trilli says about the work ethic the band instills in themselves. As a group, The Flukes value communication and chemistry, something that naturally builds from their family dynamic and shared desire to progress. “We’re in communication everyday, not a day goes by where I’m not talking to these guys” lead singer Missry says. For The Flukes every opportunity is worth taking and the band is focused more than ever on representing their strengths. “We’re definitely for the purest music fan we’re just a singer, a bassist, a guitarist and a drummer on stage, we’re very old school rock and roll” Missry says of the group’s appeal. Regardless of what the future holds the band will continue to perform and bring their sense of fun and energy with them while maintaining their momentum. Judging by the progress they’ve endured already their success is no fluke at all. * You can stream The Fluke’s latest single “What a Ride” on Spotify and all other major platforms, listen to it below! You can catch them performing at The Freehold Plaza September 29th at 7 Pm! There are few things more classic than pure pop punk and it’s always exhilarating to see new talent emerge in this genre and completely embrace it’s spirit and freedom. Local Monmouth County based pop punk band Drive, Kid have given us their take on the genre with their latest LP Enjoy Being which over it’s 11 tracks celebrates their early 2000’s punk and alternative influences with catchy hooks and guitar parts, biting yet vulnerable lyrics and lots of energy and momentum as well. Much of the LP represents the band’s vibrant and personal sound as evidenced by stand-outs such as “December 11th” which has a grand and soaring sound and lyrics that are powerfully performed and relatable. In terms of production and unity, the band display strong chemistry and display a diversity of sound throughout, the LP contains elements of ambient, hip-hop and folk at various points and there’s an even ratio of heavier and slower selections sequenced seamlessly together. What allows Enjoy Being to remain a compelling listen is the sheer enthusiasm in the performances, when the band performs a number called “Shitkicker” it’s just as visceral and hard-hitting as you’d expect and track “Burn Book” demonstrates their tightness as a unit while still delivering catchy hooks and establishing their own style. Much of Enjoy Being is a cohesive listen with each track building off the other and containing an almost cinematic quality at times. On track “Hey October” the band experiment with grander more epic style arrangements and displaying a conceptual ambition in the process. This sense of go for broke and pure vitality is what makes Enjoy Being an exciting listen and Drive, Kid a promising band. Overall Enjoy Being emerges as a polished, briskly paced and hugely enjoyable listen with strong songwriting and solid performances. Most importantly it’s fast, loud and heartfelt as my punk pop. Should be, a drive well worth taking indeed. Communication is an important part of our every-day lives and we all want to be understood somehow someway. This topic is a fodder for many artists and musicians and Asbury Park-based singer/songwriter Rachel Ana Dobken mines this subject matter gracefully in her sultry and atmospheric new single “understand” off her upcoming LP When It Happens To You. The song serves as a strong case for Dobken’s understated yet purposeful vocal performance which establishes mood and tone with confidence. Musically the track appears simple with hazy guitars and moody organ but the more listens you give it, the more the track’s ambiance washes over you and reveals it’s layers. Lyrically “Understand” highlights perspective and a desire to know where one is coming from, this could be heavy-handed subject matter but once again Dobken’s vulnerability and insightful writing anchor the track giving it an emotional resonance. As a single, it’s pacing is light and breezy but manages to convey a good deal of musical substance in it’s runtime. The instrumentation including a guest harmonica appearance from famed rock photographer and artist Danny Clinch organically connect into one another and create a cohesive soundscape. It’s a well-balanced piece of production that allows it’s songwriter room to breathe while also demonstrating sonic nuance and style. The end result is an engaging and focused track that represents Dobken’s musical and lyrical strengths and effectively sets the mood for her upcoming release. If this first single is any indication of what the future holds, it won’t be too hard to understand Ms. Dobken at all. There’s many ways to describe Josh Tillman’s music and his persona of Father John Misty, however typically one would never use the word optimistic. The latest album before his most recent release Pure Comedy, was a chronicle of a society losing it’s grasp on basic human communication and longed for a genuine connection. In many ways Pure Comedy was an accomplished album but at times it felt easier to admire than to like, perhaps Tillman was so focused on big ideas he forgot how to engage in small talk. Thankfully on his most recent outing with the Father John Misty moniker God’s Favorite Customer, Tillman’s songwriting showcases a clearer sense of empathy and insight while serving as a tremendous progression musically and thematically. Of course this being a Father John Misty album there’s still a notable sense of dark humor and irony coursing throughout it’s 10 songs with names such as “Hangout at The Gallows” and “Please Don’t Die” however, spending time with these songs reveal emotional layers and a sonic richness as well. Opener “Hangout at The Gallows” demonstrates some diverse arrangements as it blurs the line between folk and Jazz and “Please Don’t Die” ends up becoming one of his most stunning ballads illustrating a newfound warmth over some of his most understated production and nuanced storytelling. What truly distinguishes God’s Favorite Customer from Tillman’s other releases is it’s emphasis on capturing moments of sincerity. Stand-out numbers “Dumb Enough to Try” and “Disappointing Diamonds Are The Rarest of Them All” offer a multi-faceted portrait of Tillman as a romantic and contain some of his most fully committed vocal performances along with some of his most simple yet heartbreakingly effective lyrics. If anyone was fearing this was going to turn into a sentimental record fear not as Tillman still finds time to parody his own debauchery on “Mr. Tillman” and skewer hipster culture on “Date Night”, and on “The Songwriter” we witness him at his most raw as he wrestles with his attachment to channeling his experiences into art. The sense of balance and cohesion between the songs here allows for God’s Favorite Customer to establish itself as his most well-rounded release since I Love You, Honeybear and is a noted return to that album’s personal focus and generosity of feeling. Even the production here has a lightness of touch from the retro 60’s stylings on “Date Night” to the lush opens of ballad “The Palace” musically this album feels more organic in it’s textures and soundscapes. In the past I’ve occasionally had a hard time deciphering Tillman’s perspective or motivations but with this album his concerns are at their most approachable and relatable. Closing track “We’re Only People” contains plenty of soul and grand arrangements but what truly sells it is that it serves as a celebration of the human experience. On each of his records, Tillman portrays Father John Misty as a man attempting to connect to the outside world while feeling complete within himself. On God’s Favorite Customer, he gets closer and closer to achieving that truth. Maybe one day he’ll get there maybe one day he won’t but god bless him he’s still dumb enough to try. Despite the numerous line-up changes and stylistic shifts Panic! At The Disco has endured one common theme has survived, that of human excess and sin. Their break-out hit was called “I Write Sins, Not Tragedies”, one of Urie’s most emotional ballads is titled “This is Gospel”, and the new album’s roll out has fans being labelled “sinners”. This dynamic between indulging in one’s own self and repenting has been a long-time conflict in Urie’s music up until this album Pray For The Wicked where extravagance is center-fold and subtly is nowhere in it’s vocabulary. On album opener “(F**K a) Silver Lining” Urie exclaims “Everything is cherries on top” and that’s an apt description for his latest release which is a pure desert of a record with sprinkles and hot fudge dripping right off of it.” Silver Linings” establishes Urie’s mission statement here effectively, riding in with bombastic production creating a mix between retro swing and modern pop. The momentum carries through it’s next two tracks with “Say Amen (Saturday Night) escalating the pomp with gospel elements and a bit of hip-hop thrown in for good measure all while Urie struts out his towering vocals, and on latest single ” Hey Look Ma I Made it” he utilizes some disco-jazz grooves to celebrate his ascent into the stratosphere. 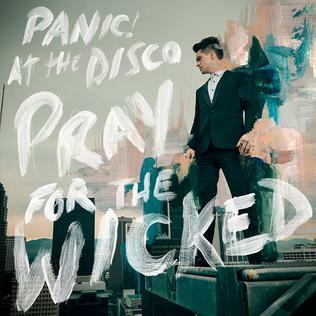 Throughout it’s 11 songs, Pray For The Wicked is mostly able to sustain it’s own manic buzz and lavish nature due in part to Urie’s pure conviction and exuberance. On each track he’s dedicated to achieving pure spectacle and somehow he’s able to more or less accomplish it with the exception of a few tracks such as “One of The Drunks” which tries to examine Urie’s own penchant for debauchery but doesn’t quite hit the mark. But when the record hits it really hits and on two of it’s stand-outs “Dancing’s Not a Crime” and “Overpass” marries big band style brass with Hollywood noir with dashes of rock and soul sprinkled in-between. It’s not a surprise that Urie just recently finished a stint on broadway as Pray For Wicked has showmanship bursting from it’s seams, this same characteristic can be seen as self-indulgent but thankfully it doesn’t wear out it’s welcome. For all of the celebrating and grandstanding these songs can contain, there’s are a surprising amount of vulnerability lying underneath. On “King of The Clouds” we see Urie questioning who he can trust around him and on “High Hopes” he acknowledges a time period where success was right around the corner but not yet tangible for him. Songs to Spin: (F**K a) Silver Lining, Dancing’s Not a Crime, Overpass, Roaring 20’s, Say Amen (Saturday Night). “Do You Like Tennis?” A friend of mine asked me a few weeks back. I flashed back to when I was in middle school and had a really weak serve and thus my dreams of being the next Roger Federer were squashed instantly. Thankfully, my friend was referring to the husband and wife synth-pop duo of Alaina Moore and Patrick Riley who were just so happening to be playing Asbury Lanes. Admittedly, before walking into their show last night, I hadn’t heard any of Tennis’s music or knew much of their background, however upon seeing them perform live at the recently renovated Asbury Lanes it’s hard not to feel just a little entranced by them. Before the duo took the stage, the band known as Lyons came out to warm up the crowd and set the mood. Lyons, an all-female five piece came out with full intensity giving the sound system a good workout in the process. Their sound is a mix of garage-band style indie rock mixed with some of the 80’s synth-pop aesthetic shared by Tennis itself. Throughout, their set was high-energy, vibrant and complemented and contrasted the headlining act quite nicely. When it finally came time for Tennis to perform I was instantly curious about how they would make their entrance and what experience I was about to have. When the lights came back on again and the sound system cued up once more I was pleasantly surprised. The duo instantly set the mood with their atmospheric yet lush keyboards courtesy of Moore while Riley gamely provided support on guitar. Lead singer Alaina Moore was decked out in a sequin top embodying a 70’s/80’s aesthetic that was wonderfully sustained throughout the set. What made watching Tennis perform so engaging was the chemistry the husband and wife duo exhibited on stage together. That may seem like an obvious observation, but during each song the two played off of each other seamlessly and their interactions brought out an energy and exuberance that elevated the impact of their songs, During a number titled “Matrimony” dedicated to her husband, Moore was purely uninhibited dancing and shimming on stage and giving off a radiant energy that proved hard to ignore. The most refreshing aspect of Tennis’s set had to be how well-rounded and cohesive the song selections were. There were upbeat dance numbers that got the crowd moving, there were mood pieces that gave off pure atmosphere and songs that were so breathtakingly intimate they could’ve been prom anthems. From song to song, lead singer Moore was charming, open and funny it almost felt like sharing an evening with a friend if your friend just happened to be in a really artsy indie group. As they closed out their set, Tennis undoubtedly left an impression upon me showcasing how a small-scale group can achieve the same level of attention as any big-name act could muster. I may not still know all there is to know about Tennis, but I can say judging off of last night’s performance the ball is definitely in their court.